proudly released thru Grand Theft Audio. blame them. other fine Even Worse releases: well, there's the New York Thrash compilation, available through ROIR International (two songs, allegedly it's available on CD now but their site is wack), and also You Can't Argue With Sucksess, a Mystic Records USA compilation (two more songs, try ebay cos i can't find it), and the same stuff is also on their Best Of Mystic, Vol. 1, but I do not know why. basically you should just buy our CD and get the maximum bang for yer filthy lucre. merely a suggestion. 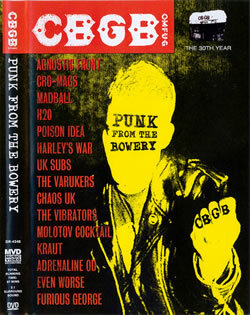 the CBGB DVD "Punk From The Bowery"
click here to go to the CBGB Store page. try to ignore all the other rubbish and click on 'music'. we are on this doing "Major Headache" live at the NY Thrash 20th Anniversary show in June '02... there's a review of the DVD here but for some reason it says we do some other song none of us have ever heard of! and there's lots of other bands too!